Sanitation Workers in N.Y., D.C. Strike Against Waste Management Inc. 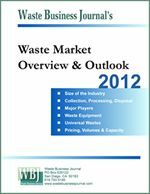 Waste Services, Inc. (Nasdaq: WSII) will release its 2006 first quarter results after the close of markets on Tuesday, April 25, 2006 and hold a conference call on Wednesday, April 26, 2006 at 8:30 a.m. (EDT). A copy of the first quarter press release will be available on our website after its release. Our Chief Executive Officer, David Sutherland-Yoest, accompanied by other senior management, will discuss the company's first quarter results. About 100 Teamster sanitation workers in both New York City and Washington, D.C., declared a strike today against Waste Management Inc., the country's largest private waste hauler.